The Council candidates faced off in a debate mostly in Spanish but continue to reveal major differences especially on housing. Many of leaders of San Diego’s Democratic Party have decided against taking a position on rent control. Proposition 10, which would ease state restrictions on how cities can enact rent control, has threatened to pit Democrats against each other. Seeing as much, Senate President Pro Tem Toni Atkins, Assemblyman Todd Gloria and San Diego City Council President Myrtle Cole have each said it is not a topic on which they care to opine. 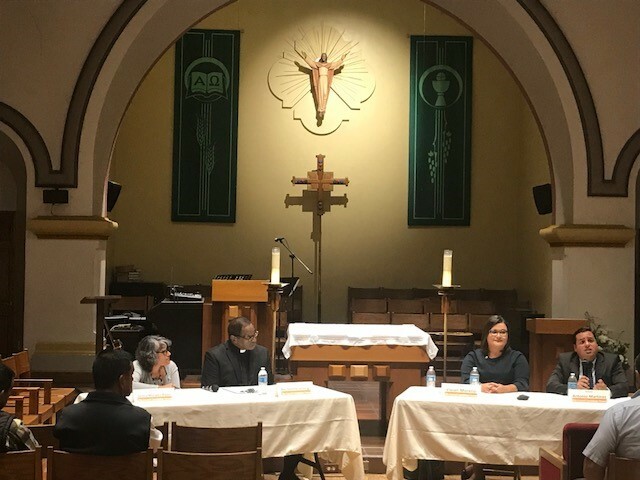 But at a forum Thursday night hosted by the San Diego Organizing Project and conducted almost entirely in Spanish, two candidates for the City Council’s open District 8 seat bucked their party’s leaders and demonstrated some political bravery. In a race where both candidates have outlined similar priorities, their difference provides a clear distinction that might help voters make a decision. Antonio Martinez, a trustee on the San Ysidro School District, said San Diego needs rent control. Vivian Moreno, a staffer to Councilman David Alvarez, was just as unequivocal in the other direction. Martinez also took aim at the city’s inclusionary housing policy, which lets developers pay a fee toward future affordable housing construction to avoid building affordable units as part of their projects. He said that needs to stop. Moreno said her vision is for Commercial Street, a stone’s throw from the church in which the debate was held, to be lined up and down with new mixed-use developments, like the Comm22 project at Commercial and 22nd Street, and that the city needs to make it faster and cheaper to get permits for new housing projects. The debate did not focus heavily on local concerns. Audience members and event organizers asked the candidates what they could do to protect residents from the Trump administration’s immigration policies. Martinez, for instance, said it isn’t enough that city leaders supported SB 54, the so-called sanctuary state bill, or that the police chief has pledged not to work directly with federal authorities on immigration enforcement. He said the city should follow the leads of Long Beach, Santa Ana and Oakland, by establishing a legal defense fund for city residents facing immigration crackdowns. Moreno, meanwhile, said the city could consider administering grants to local nonprofits to help residents attain citizenship, because right now too few people decide not to because it’s too expensive. The Lincoln Club of San Diego is among the region’s most influential political institutions. Its funding has assisted local Republican candidates and ballot measures for years, especially by fueling the political action committees in those races that send the political attacks that candidates aren’t typically willing to make on their own. The overwhelming majority of the group’s donors are local business owners, political professionals and office holders donating either individually or through their campaigns. But a handful of out-of-town businesses have cut checks too. The Lincoln Club raises in the ballpark of $800,000 a year, and donations from out-of-town donors are a fraction of the group’s finances. The most recognizable national companies to have donated to the Lincoln Club over the last few years are Walmart and the rental car company Enterprise. Walmart donated $5,000 to the group in 2017 and $10,000 in 2016. In 2015 and again in 2017, the political action committee for Enterprise donated $1,000. The Geo Group Inc., a major private prison company, through its political action committee donated $7,500 in 2016 and $11,000 in 2017. The Herzog Contracting Group is another regular out-of-town donor. The massive construction and rail company is based in Missouri but has significant business in San Diego; for instance, it was part of a group called Mid-Coast Transit Constructors that in 2014 won a $10 million contract from SANDAG for the general contracting and construction management for the Mid-Coast Trolley extension. Herzog gave the Lincoln Club $2,500 in 2015 and 2016 and $5,000 in 2017. It’s been a breathless couple weeks for Rep. Duncan Hunter. The indicted East County Republican accused his non-Muslim opponent of being a Muslim terrorist attempting to infiltrate the government. He then dispatched three retired generals — “defense industry lobbyists,” as the Daily Beast put it, “with extensive business before Hunter’s committee” — to portray Democrat Ammar Campa-Najjar as a would-be traitor. As the 50th District dumpster fire continues to rage, we were surprised to see that the Association of Cannabis Professionals is sticking by Hunter. Though officially nonpartisan, the San Diego-based trade group — which has forced new markets for marijuana on local officials — is run by Democratic political consultants. What gives? Dallin Young, ACP’s executive director, pointed to Hunter’s voting record. The congressman has supported efforts to let VA doctors talk to patients about medical marijuana therapies. He’s also supported amendments that force the federal government to respect state marijuana laws. He even co-sponsored a 2015 bill that would have loosened restrictions on CBD, a non-psychoactive component of marijuana that’s been proven to help children suffering from epilepsy seizures. NORML, a national marijuana reform group, gave Hunter a B+ on its latest congressional scorecard, which was higher than the scores attached to any of San Diego’s members of Congress. To be clear, ACP split its endorsement in the 50th District. The trade group is encouraging residents of East County to vote for Hunter or Najjar-Campa. Do you have tips or feedback for the Politics Report? Email scott.lewis@voiceofsandiego.org or andrew.keatts@voiceofsandiego.org.